The Dojo Sensei is attracted only to Onyx Gorgonzola. No Charms are required to attract the Dojo Sensei. Hunters can encounter the Dojo Sensei only in the Pinnacle Chamber location. The Onyx Mallet Blueprints are required to craft the Onyx Mallet weapon. Attraction info and special event loot drops for the Dojo Sensei can be found at the individual event location pages. The Dojo Sensei drops the Furoma Egg during the annual Spring Egg Hunt. In the first month that the Dojo Sensei was released, MouseHunt developers hosted a contest to determine the top three hunters who could catch the most of this breed. Prizes were awarded in the amounts of $50 of SUPER|brie+ (3,500 pieces), $25 of SUPER|brie+ (1,600 pieces), and $10 of SUPER|brie+ (500 pieces), respectively. 9 March 2010: The Dojo Sensei was released as part of the MouseHunt Birthday II event. 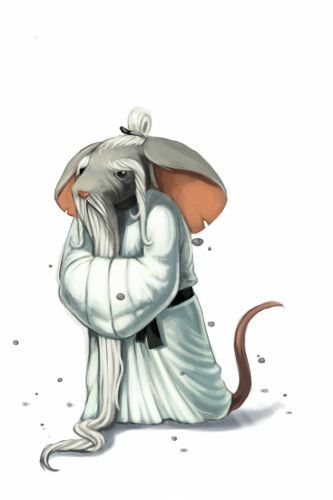 8 June 2010: The Dojo Sensei was originally named the Dojo Sensei Mouse. Its name was changed with the release of MouseHunt Version 3.0. 25 January 2011: The Dojo Sensei began to drop Divine Orbs as loot. 29 August 2012: The Dojo Sensei began dropping Ancient Relics as loot. This page was last edited on 25 February 2018, at 03:44.